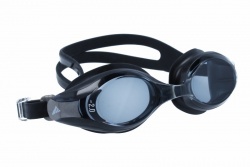 Aquavista swimming eyewear are specially for this sport. They ensure correct and quality vision both inside and outside water. They avoid water coming in and any kind of bacteriological infections. Furthermore, this glasses have anti-fogging treatment. Aquavista glasses come with a silicone cap, a neoprene case with zipper and some rubber bridges with different sizes to use the most comfortable for your nose. In fact, Aquavista glasses are very comfortable and long lasting.